Sticking with these ratios tends to be very easy when one cooks for one’s self and doesn’t rely on grocery store packages to fulfill one’s food goals. Sticking to the periphery of markets where the fresh stuff resides keep temptation to a minimum. With macrobiotics, meals tend to center around a base of lentils, beans or rice mixed with vegetables, greens and spices. This foundation is then accented by sauces, dips and fermented condiments like kimchee and sauerkraut. Pick a cup’s worth of a bean or grain. Pick some fresh, seasonal greens and vegetables to chop up. Saute that all together with olive, sesame or coconut oil, spices and/or herbs of your choice. Throw in a sweet, savory or spicy vinegar, dressing or sauce. 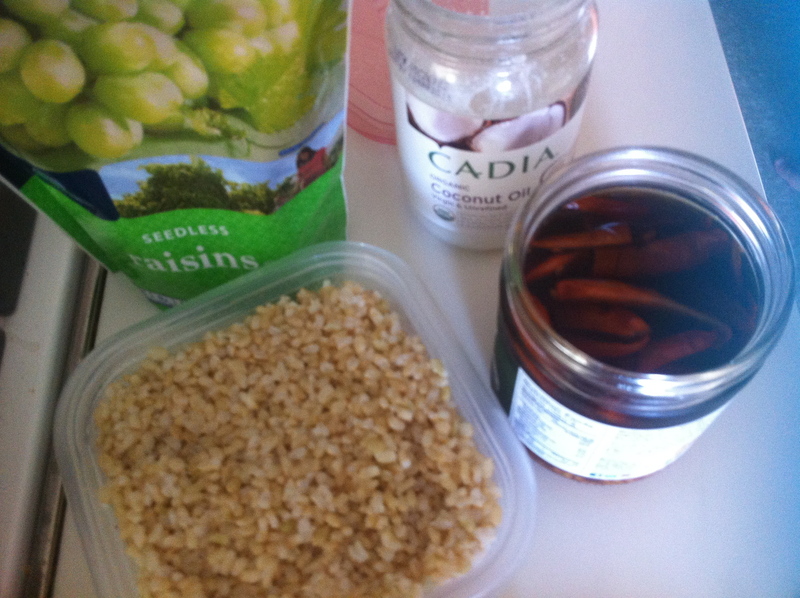 Sprinkle in some creative and nutritional additives like dried fruits, nuts or seeds. Voila, you have a meal. I am currently at work on a collection of recipes that encompass the most successful results of my experimentation in this vein. The first one marries my love of exotic spice with my addiction to coconut. 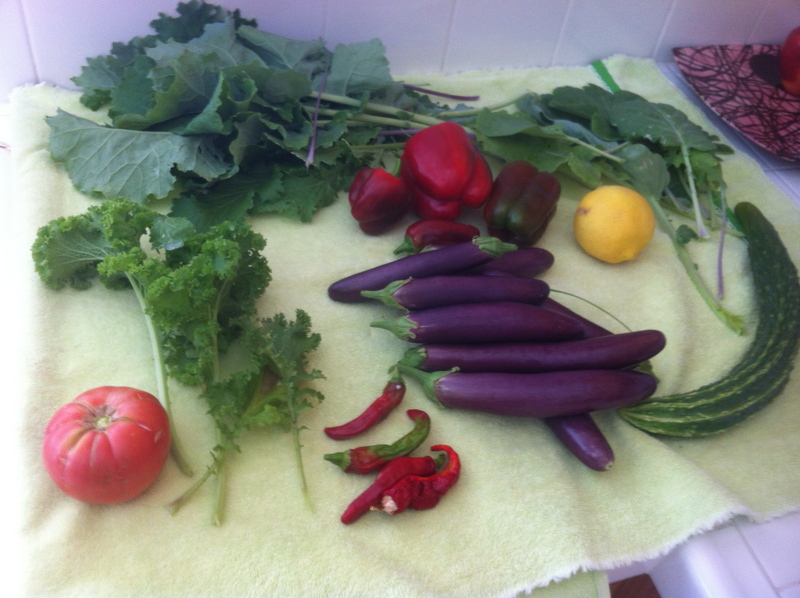 It also incorporates vegetables gathered from my very own garden, which the Cute Gardener cultivates with an amazingly green thumb. The surprising marriage of raisin and eggplant turns into a warm, buttery texture in the mouth similar to creamy Thanksgiving stuffing. Over medium high heat, melt the coconut oil. 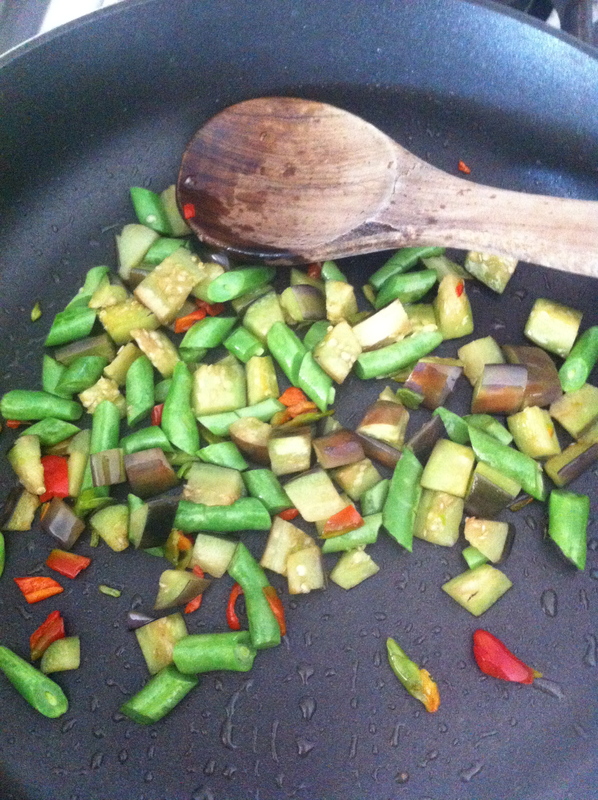 Saute the eggplant, green beans and red pepper until fork tender about five minutes. 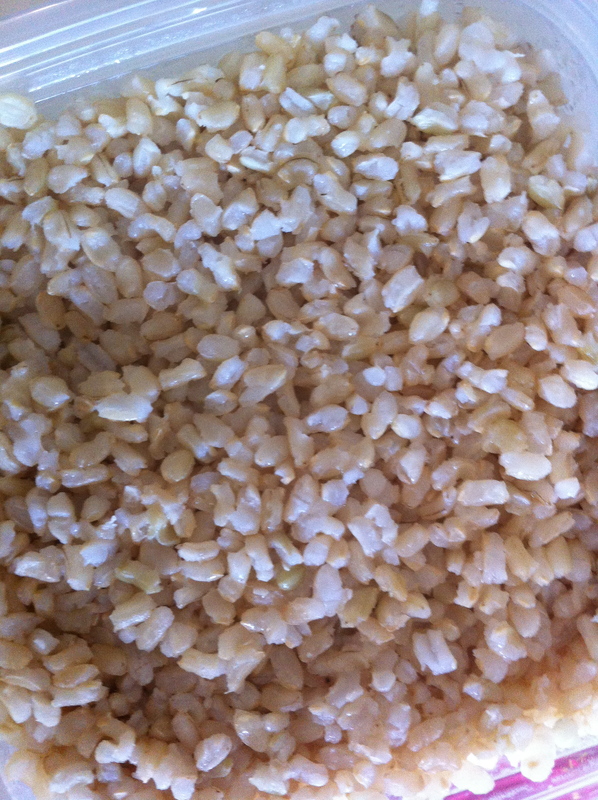 Add the brown rice untill warm. Toss in the raisins and sprinkle in the Sanam vinegar. Pour into a bowl and enjoy! Take 1 ounce of dried East Indian Sanam peppers and chop up. Place chopped up peppers and seeds into 8 ounces of your choice of vinegar in a jar with a lid. I used red wine vinegar for this recipe. Let the jar sit in on your kitchen counter for one week. Then strain and put the liquid into a container in your fridge to use at will. This entry was posted in Art of Cooking and tagged art of cooking, homemade vinegars, Kimberly Nichols, macrobiotic cooking, macrobiotic recipes, rice bowl recipes, sanam chili recipes, Unorthodox Foodie by unorthodoxfoodie. Bookmark the permalink. Thank you Linnet! That is a wonderful thing to hear!